Jerry P. Leamon is the Director of Korn Ferry International’s Board and serves on the Audit Committee of their Board. Jerry is also a member of Credit Suisse USA’s Board of Directors. 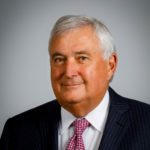 Jerry spent 40 years at Deloitte & Touche LLP, serving as a Global Managing Partner and a member of the Board of Directors for their global organization and their U.S. member firm. Jerry is a graduate of the University of Cincinnati and holds a CPA certification.